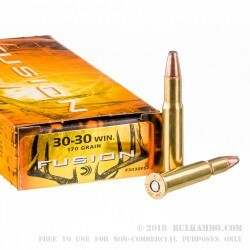 As the first rifle ammunition made specifically for deer hunting, Federal’s Fusion line is one of the best tools to nab that buck this season. The Fusion line comes equipped with a skived tip, which allows for better expansion at long-range, without sacrificing power up close. Each bullet jacket is electrochemically fused to the core for maximal weight retention, while a pressure-formed core provides a one-shot-stop terminal expansion. The boat tail, increases aerodynamic efficiency, making for an extremely accurate projectile. 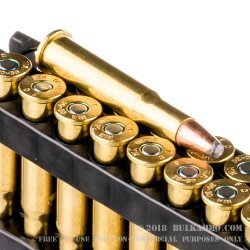 Perfect for that old Marlin, these .30-.30 Winchester rounds come 20 to a box and are loaded with a 170-grain projectile into boxer primed, noncorrosive, reloadable brass casings. 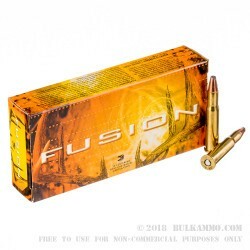 Capable of a muzzle velocity of 2200 FPS, these rounds are accurate and deadly at long range. With a reputation for producing high performance ammunition, Federal’s name has become synonymous with quality and reliability. For nearly 100 years, Minnesota-made, Federal has provided generations of shooters with ammunition they can trust, for a wide variety of shooting sports.